The name is “Aulani, a Disney Resort & Spa, Ko Olina, Hawai‘i.” Thats awfully long. It needs an acronym, right? How about AADR&SIKOH? Or maybe just ADRSIKOH? Lets just call it Aulani. 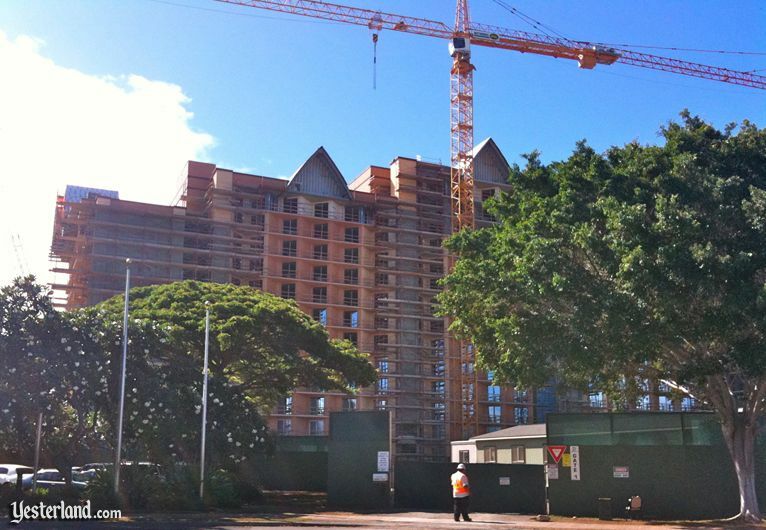 A few days ago, Yesterland reader Mike took photos from various vantage points around the West O‘ahu construction site. The timing is good because theres plenty to report about Aulani too. Aulani rises in the distance beyond the Coconut Plantation at Ko Olina. There’s now a DVC point chart for Aulani. The website for Aulani has floor plans and artwork. And DVC guides (salespeople) have price sheets with incentives (discounts) that get better as the number of points go up. As long as you’re in state where Aulani can legally be sold, you can reach for your checkbook or credit card. The architecture of the lobby of Aulani is inspired by a Hawaiian canoe house. A full week in a two-bedroom, ocean-view villa in mid-summer every year requires 553 DVC points. DVC is currently offering a $12 discount off the $114-per-point price for purchases of at least 250 points. For 553 points, the total works out to $56,406. Then there’s the annual maintenance fee of $4.31 per point, which would be $2,381 in 2011. As the cost of operations goes up over time, the maintenance fee will gradually increase. Aulani overlooks the sandy beach at Ko Olina lagoon 1. Based on this example, it may seem expensive, but the pricing is not out of line for what you get. Also, you don’t have to spend anywhere near that much to buy into Aulani. 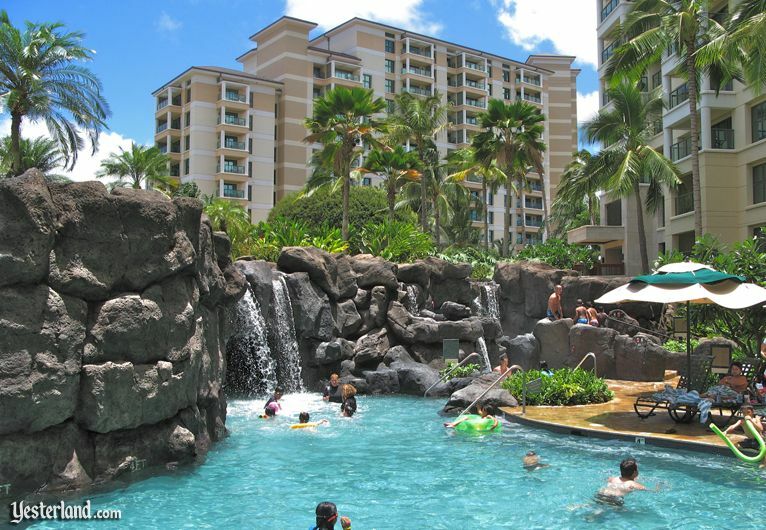 Even with a substantially lower initial point purchase, you can still enjoy Aulani vacations. Just plan on some combination of smaller villas, shorter stays, fewer stays, or less magnificent views. 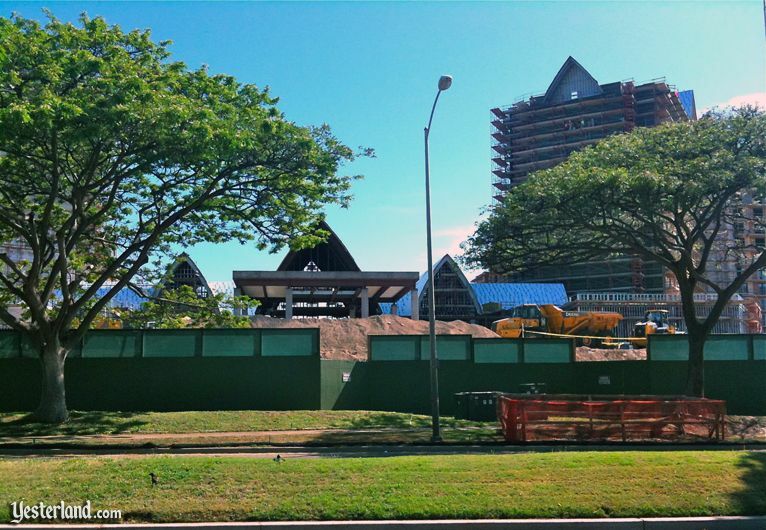 Aulani is starting to look like a tropical resort, not just a construction site. The Aulani is worth considering for people who would like a Hawaiian resort with Disney showmanship, who can plan ahead, and who can afford it. Because Aulani is part of the DVC system, it also opens doors to ten other DVC resorts and various other options for using DVC points. 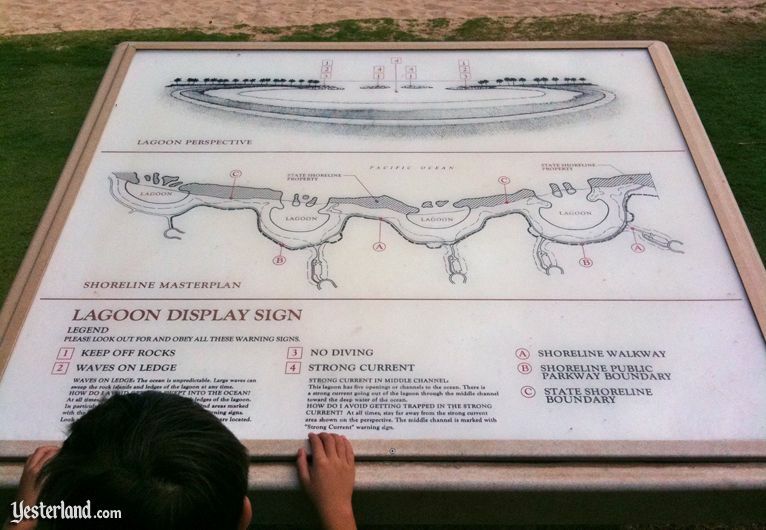 A child examines a map of the four manmade lagoons at the Ko Olina Resort. The all-DVC wing looms above Disneys construction office. Makahiki Buffet Restaurant: An Open-air dining room for character breakfasts and casual dinner buffets; featuring fresh local cuisine, including line-caught sustainable seafood. The ‘Olelo Room: A tropical lounge serving continental breakfast, traditional afternoon tea, local specialties, and cocktails; adjacent to the Makahiki Buffet Restaurant. ‘AMA‘AMA Beachside Restaurant: A beachside restaurant and lounge serving breakfast, lunch and dinner—and spectacular sunsets. Work has begun on the volcano. 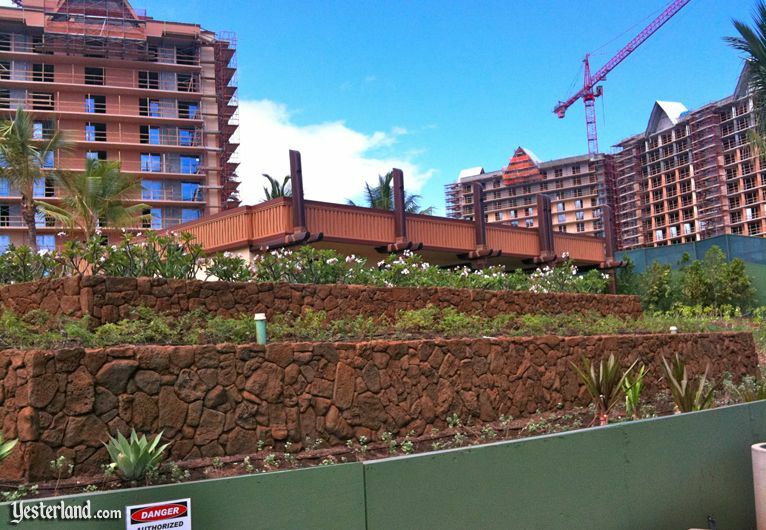 The balconies at the right are part of the JW Marriott Ihilani Resort. As the photos in this article show, the resort already looks a lot like the renderings and the model. As workers complete the exterior walls and install all windows, the buildings will soon look largely complete on the outside. Of course, there will still be plenty to do on the inside. Cars will we relegated to multi-level parking garages at the back of the property. If you want a reminder of what the site looked like a year ago in July 2009, take a look at this article. Center of photo: Two new shopping centers at Olani Street and Aliinui Drive. 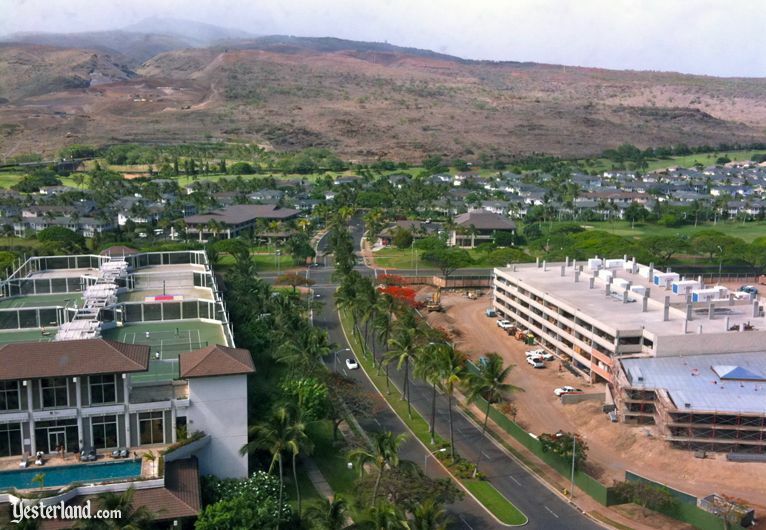 Ko Olina Station and Ko Olina Center, two shopping centers by the same developer, are across the street from Aulani and the JW Marriott Ihilani. Although completed last year, the centers have been without tenants. 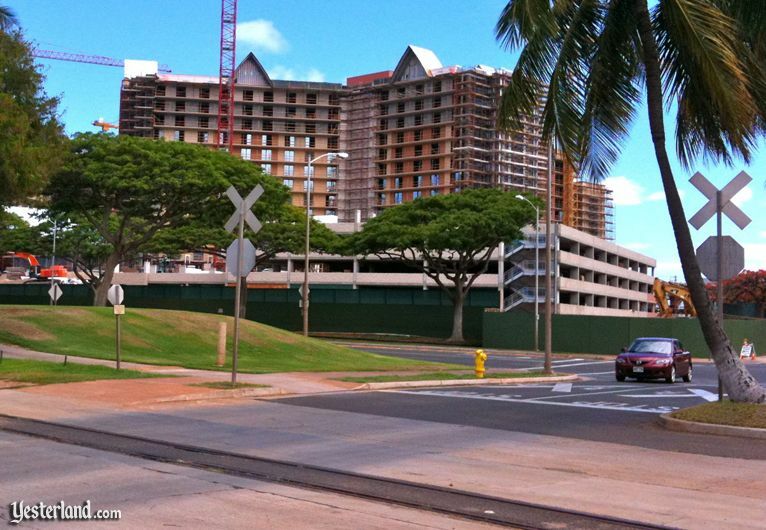 The centers are likely to get a lot of foot traffic from Aulani, especially once all phases of Aulani are complete. Disney guests will look for lower cost alternatives to Disney food, sundries, and souvenirs. But until then, the customer base for the new shopping centers is fairly small. Most merchants seem holding off for now. Businesses are starting to open at Ko Olina Station, one the two new shopping centers. 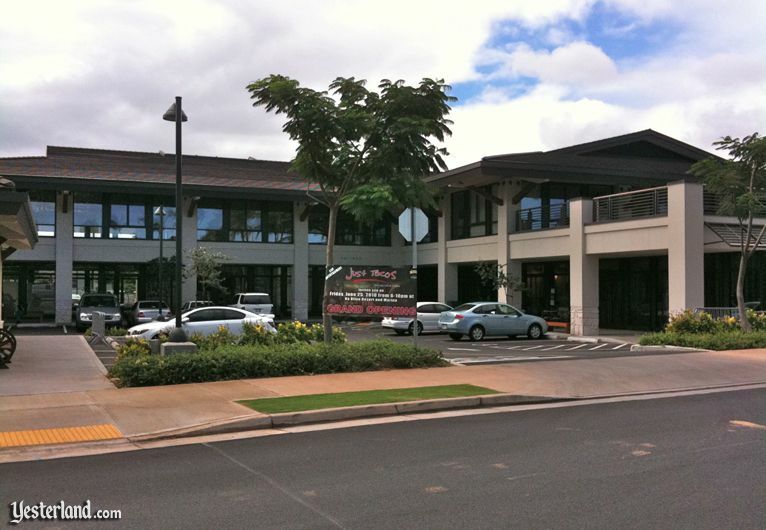 A few businesses are finally opening their doors at Ko Olina Station. The first was Two Scoops Ice Cream Parlor and English Tea Room, which opened in April. “How do you say ‘Aloha’ in Spanish?” Family-owned Just Tacos Mexican Grill & Cantina opened at Ko Olina in June. Island Country Markets also opened in June. It’s owned by ABC Markets, the convenience store chain that seems to be on every corner in Waikiki. The Ko Olina location is an upscale concept, complete with a full-service deli and a selection of wines. There’s also Ko Olina Hawaiian Bar-b-que. Railroad crossing? Yes. But dont worry about the rumble of freight trains. In addition to crossing the street, Disney guests will have to cross a railroad track to reach the shopping centers. It’s a small remnant of the historic O‘ahu Railway. 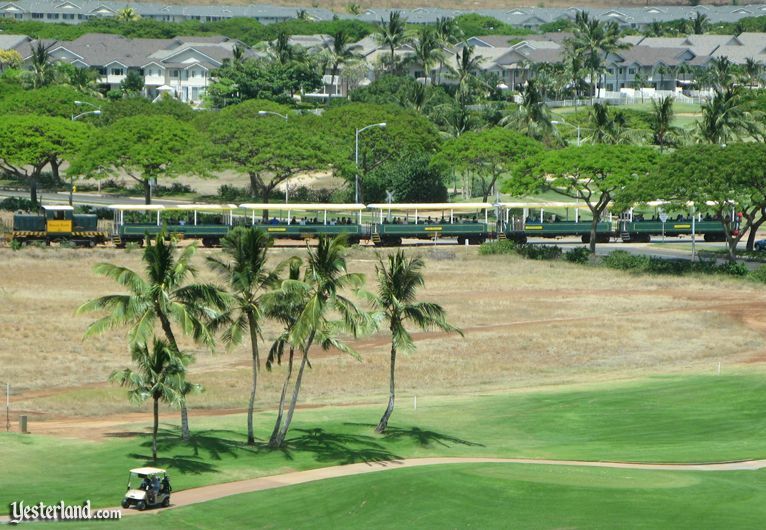 The only train through Ko Olina is an occasional sightseeing train on the narrow gauge track. These days, the Hawaiian Railway Society, an educational, non-profit organization, operates a slow sightseeing train with two departures from Ewa Beach each Sunday. That’s all. The shopping center developer and the Railway Society have tentative plans for a passenger stop at Ko Olina Station. It remains to be seen if train excursions will originate there, or if it would only be an intermediate stop for excursions coming from the current starting point. Perhaps families staying at Aulani would provide enough new passengers to justify excursions originating at Ko Olina. From now on, Marriotts Ko Olina Beach Club is selling points, not weeks. 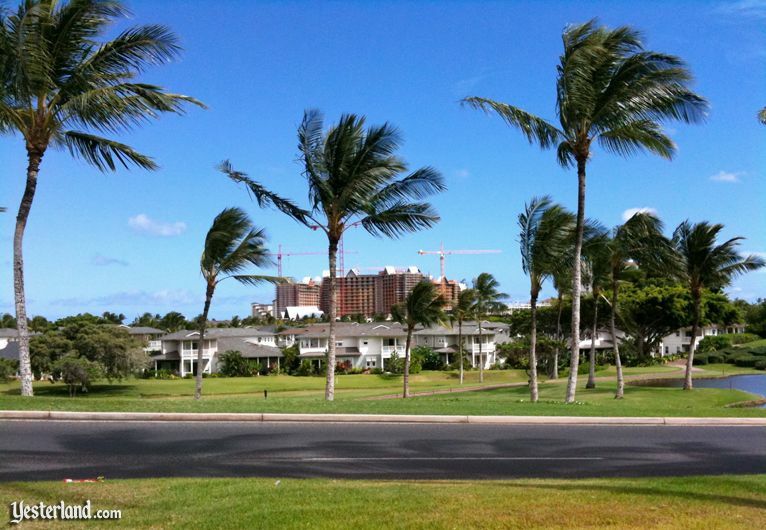 Marriott Vacation Club International (MVCI) also has a resort at Ko Olina. It’s a beautiful property. You’ve undoubtedly heard the quotation, “Imitation is the sincerest form of flattery.” DVC should feel very flattered by MVCI. A few weeks ago, on June 20, 2010, Marriott launched a points-based product called Marriott Vacation Club Destinations in the United States and Caribbean. After a quarter century of selling a weeks-based timeshare product, Marriott switched overnight (after years of planning) to a product that in many ways looks like to DVC. Hey, DVC members: Does this sound familiar? Each of the 47 MVCI resorts in the United States and Caribbean now has point chart with a grid of seasons and villa types. Friday and Saturday nights require more points. Points can be used for Marriott hotel properties through the Marriott Collection, but the value is not as good as for MVCI villas. Owners have other options, such as cruises and active adventures, through the Explorer Collection. And it’s possible to use points stay at other timeshare brands through the World Traveler Collection, but you need to careful to get an exchange that’s comparable in quality to what you own. There are also major differences. DVC members buy into a specific resort and enjoy a home-resort advantage when making reservations. But Marriott owners now buy into a single portfolio of resorts, and all compete against each other for reservations. To makes things worse, there are three ownership tiers based on the total number of points someone owns. Those in the higher tiers have first access to reservations, potentially making it difficult for basic owners to get the most desirable locations and vacation dates. Marriott thinks it’s a good business practice to penalize resale buyers. Disney treats developer buyers and resale buyers exactly the same. DVC point charts are protected against arbitrary, unbalanced increases. DVC ownership interests include the DVC Points programs as an integral part; there is no re-enrollment fee for resale buyers. Even though DVC ownerships eventually expire, resale prices tend to the strongest in the industry. Is Marriott less expensive than Disney? Not substantially. Using current pricing (as of July 8, 2010) and the example from earlier in this article of a two-bedroom, ocean-view villa at the Ko Olina Resort in mid-summer every year, DVC and MVCI prices are similar. The purpose of this table is only to show that Disney and Marriott prices are in the same ballpark for this particular example. The example does not take into account any one-time point incentives or the timing of first usage. Both Disney and Marriott allow much smaller initial point purchases. All numbers are subject to change. 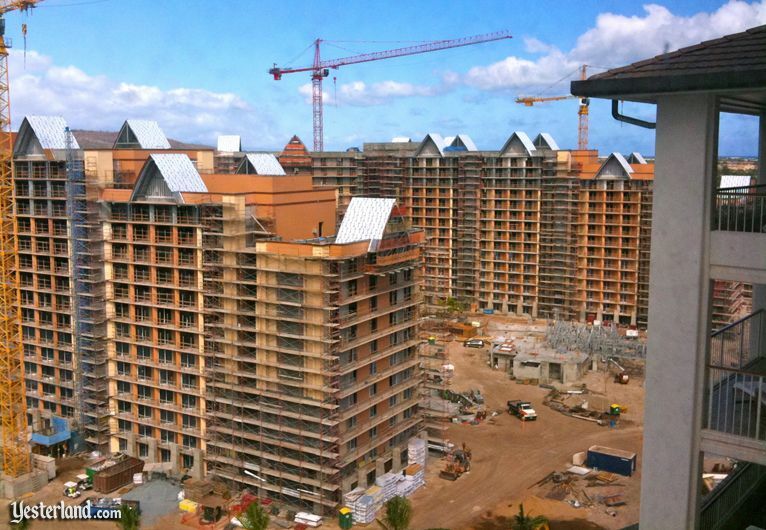 All in all, Aulani is looking really good. 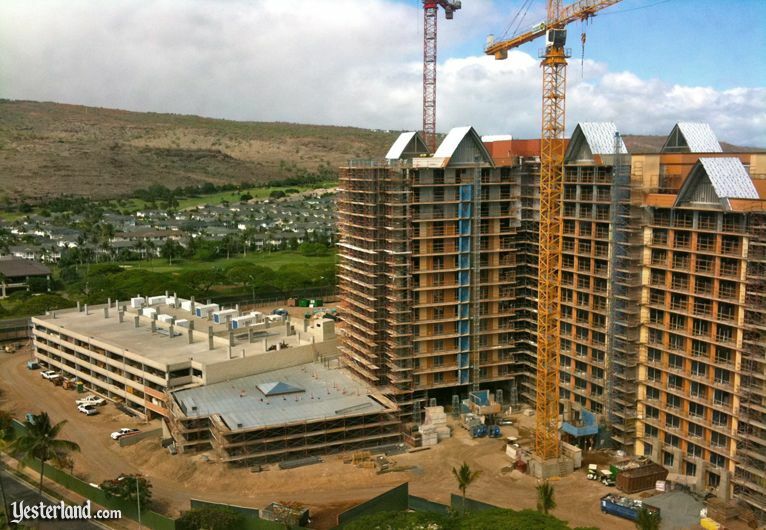 10 photographs of Aulani construction: July 2010 by Mike McMann. Photographs of Ko Olina Station: July 2010 by Mike McMann. Photograph of sightseeing train: 2009 by Werner Weiss. 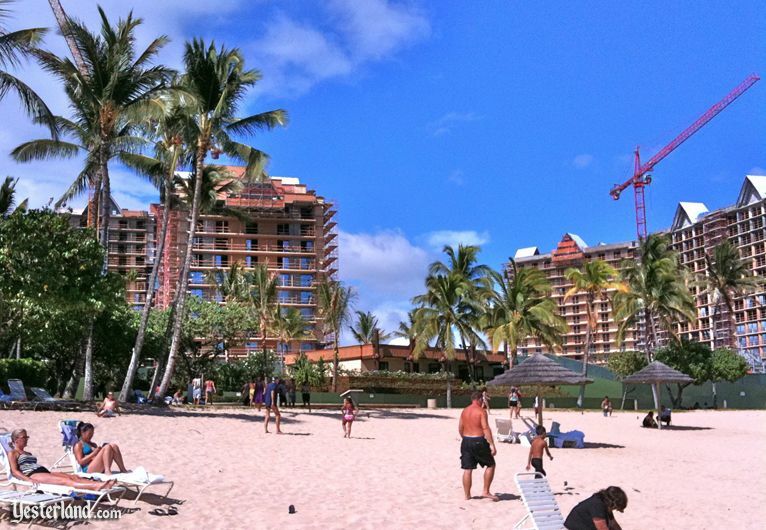 Photograph of Marriotts Ko Olina Beach Club: 2009 by Werner Weiss.